Should the United States Care about Vocational Education? In middle school, European students are tested and separated. Students are sent on to high schools that fit their intelligence, personalities and talents. Some are prepared for university. Others receive training at vocational schools. This system is foreign to most American teachers, parents and students. The idea implies segregating social classes, punishing students with lower grades and branding children for life. Yet the European vocational system can be more flexible than it sounds and yields positive results. Many young adults move directly from high school to jobs for which they are already trained and skilled. Is career preparation the responsibility of colleges only or should it start in earlier grades? In Switzerland, teenagers run entire stores. Take a cell-phone store for example. Students divide customer service, marketing, supply, financial and repair elements of the company. They work three days a week and spend two in the classroom. In three years, they graduate with a retail certificate and a breadth of practical business training. They may remain in the cell phone business, in which they have training and have demonstrated competency, or they may move laterally to a different business. They could pursue higher education now if it suits them. Two-thirds of Swiss 15- and 16-year-olds choose the Vocational Education and Training (VET) program. Some finish the program and move directly into jobs paying $50,000 a year with bonuses and vacation. The Swiss government subsidizes businesses that apprentice students. Their training ties directly to real jobs and many students go from apprentice to employee upon graduation. They may choose to pursue post-VET education and earn over $100,000 annually. Of the 8 million people in Switzerland, 80,000 apprenticed with 58,000 companies, which spend $5.4 billion on the students but collect $5.8 billion from their work. And VET is not only for the low academic producers. Forty-two percent of Swiss students scoring four or 5 out of 5 on the PISA exams chose the vocational path. In April 2014, President Obama designated $100 million for the Youth Career Connect program, which helps high schools around the country better prepare students for in-demand jobs. Students can earn an associate degree in health care, biotechnology, information technology and other lucrative fields while still in high school. The president encouraged businesses to form apprentice relationships to mold students into the employees they need. Only 375,000 students in the US are currently enrolled in apprenticeship programs. The federal government and many educators are acknowledging that a traditional college education does not prepare students for real jobs. A vocational system would provide practical experience, income and possible college credit. In addition, young adults would have a clear set of goals in an otherwise unsteady time in their lives. That awkward place between the teen years and adulthood is very sensitive. Young people can feel supported and confidently head out on their own. Alternatively, they can struggle to build their own life and make a living. Youth will be tempted to make desperate decisions or develop bad habits, ending up permanently scarred. At 18, you can easily go the wrong way or the right way and never come back. What Would USVET Look Like? Each school district can build relationships with local business partners and major employers. Seek out leaders in energy, healthcare, biotech, engineering, construction and other in-demand fields. Then administrators can analyze their own facilities and begin specializing their schools. Which high school would be best suited for the university-bound students? Which would be better for specific vocational training? Some schools will need modifications. Which have the space? Could an older facility, which may need upgrading anyway, be optimized for vocational purposes? How can vocational students participate in these changes? Have students get their hands dirty building their own new training center. Businesses should be enthusiastic to participate. Being a leader in education will be wonderful marketing. With whom will you choose to do business? The group building strong, independent young adults or the one that does not? Employers should be bidding high to be part of the vocational system. Part of vocational education will take place off-site. Half of the students can work in the field Monday and Tuesday with the other half in the field Thursday and Friday. Wednesday can be a time for both halves to join and exchange notes. Some school functions can become student-run. Administrators in charge of transportation, maintenance, food, sports and marketing can step back to be mentors, allowing students to learn how to operate a complex school system. The next generation of educators will have a head start. 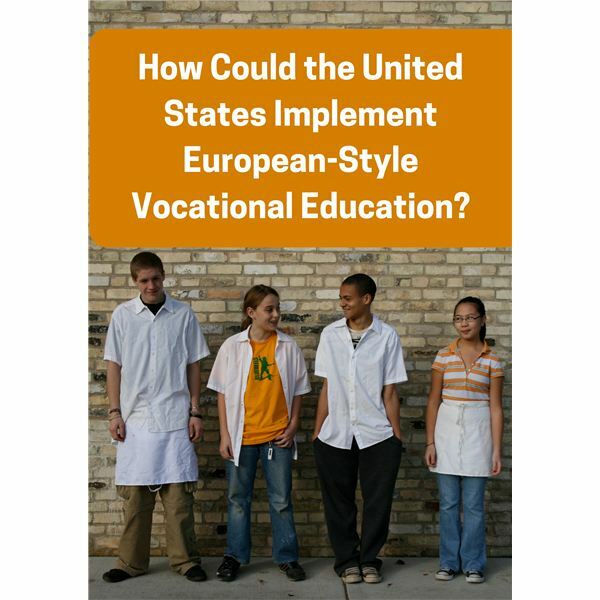 Will vocational education become a central part of American Education as it is in Europe? Like everything in a free market system, the consumers will decide. Whether or not a student chooses a vocational path or a university path will depend only a little on test scores. It will be a choice made after consultation with parents, teachers and career counsellors. It will give more options, flexibility and opportunities to students. Young adults with income, experience and self-esteem can always choose more education. With employer support, going back to school is even easier. Youths without money or skills do not have the option. They must take the job offered and try to scratch out a living. Giving high school students an advantage by offering useful job training opens the world to them.